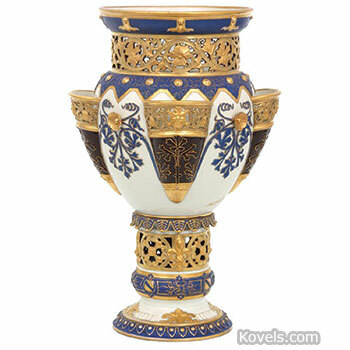 Pirkenhammer is a porcelain manufactory started in 1803 by Friedrich Holke and J. G. List. It was located in Bohemia, now Brezova, Czechoslovakia. The company made tablewares usually decorated with views and flowers. Lithophanes were also made. Manufaktura Pirkenhammer still makes porcelain and ceramic products in the Czech Republic. The mark of the crossed hammers is easy to remember as the Pirkenhammer symbol.